My Thursday self is very thankful to my Sunday self. Why? Well, because that's the day that I decided that this Thursday would be BLT night. Yum, yum and more yum! It was hard to stick to only one sandwich, but I made up for it with a second side salad. Healthy choice! I had thoughts of greesy burgers and fries for dinner, but shook those thoughts when I realized it was BLT night. I have been having strong greesy cravings lately because its "that time of the month" for me. 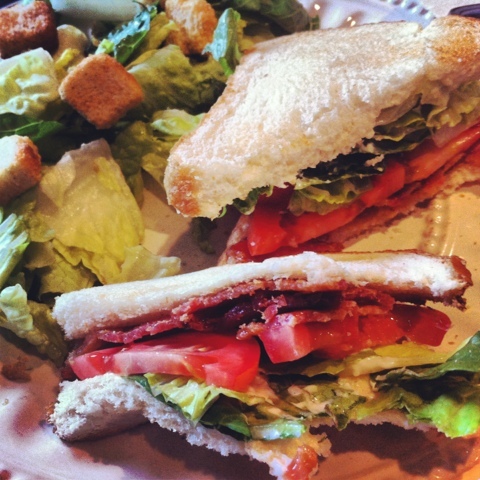 The bacon on my sandwich was kind of greesy, so that was good enough (or so I'll tell my greesy-craving-self).